Jacki Purcell began her career at Northwestern Mutual as a college intern at the Orlando, FL office. After graduating from the University of Central Florida in 2010, she chose to pursue a full-time career as an advisor and built a successful, diverse practice in the Orlando area. She met her husband, Joel (also a financial advisor), at a Northwestern Mutual’s annual company meeting in 2011. 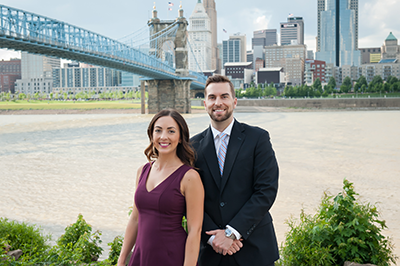 In 2012, she moved to Cincinnati where she quickly rebuilt a second client base and has since grown her practice to serve a wide range clients nationwide. She has held multiple leadership positions during her career, holds her Series 6, 26, 63, and 65, and is currently the Managing Director of the Downtown Cincinnati office. Jacki specializes in business planning, employee and executive benefits, as well as empowering women to feel confident about their finances. She has been featured locally in Venue Magazine, The Flair Confidence Podcast Series, and on Fox 19. Joel Purcell graduated from the University of Kentucky in 2008 with a degree in finance and marketing, where he was actively involved with Habitat for Humanity. After a brief role a hospital consultant, he was called to a career that would allow him to directly impact the surrounding community and beyond. Joel joined Northwestern Mutual in 2011, has earned his Series 6 and 63 and is actively working toward his CFP designation. Together, he and Jacki have merged their practices to serve individuals and families from coast to coast. Joel specializes in long-term and short-term retirement and risk management strategies for business owners, executives, attorneys, and physicians. Jaclyn Kayla Purcell uses Purcell Financial as a marketing name for doing business as representatives of Northwestern Mutual. Purcell Financial is not a registered investment adviser, broker-dealer, insurance agency or federal savings bank. Northwestern Mutual is the marketing name for The Northwestern Mutual Life Insurance Company, Milwaukee, WI (NM) (life and disability insurance, annuities, and life insurance with long-term care benefits) and its subsidiaries. Jaclyn Kayla Purcell is a District Agent of NM and Northwestern Long Term Care Insurance Company, Milwaukee, WI, (long-term care insurance) a subsidiary of NM, and a Registered Representative of Northwestern Mutual Investment Services, LLC (NMIS) (securities), a subsidiary of NM, broker-dealer, registered investment adviser and member FINRA (www.finra.org) and SIPC (www.sipc.org). Jaclyn Kayla Purcell is primarily licensed in Ohio and may be licensed in other states.